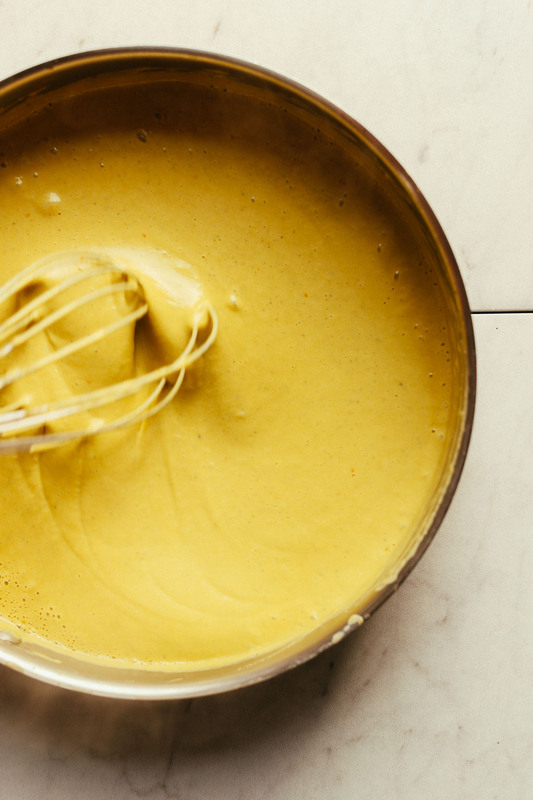 Once your pumpkin is roasted, it’s time to make the sauce, which is a simple mixture of ingredients like sage, garlic, nutritional yeast, almond milk, and vegan parmesan cheese. I added a pinch of pumpkin pie spice to add some warmth and spice as well as an optional pinch of red pepper flake for some heat. Once you cook your pasta, all that’s left to do is mix it with your sauce and serve! I opted to sprinkle on more vegan parmesan cheese, broil for a crusty topping, and garnish it with a bit of sautéed sage (which I consider extra-fancy but nonessential touches). This would make the perfect meal when you’re craving something hearty yet healthy this fall and winter. It would also make a beautiful holiday entrée or side dish. While it’s delicious on its own, it would also pair well with this Creamy Kale Salad with Chickpeas & Shallots, Apple Pecan Arugula Salad, or Oil-Free Roasted Vegetables! For more pumpkin goodness, be sure to check out our Simple Pumpkin Soup, Pumpkin Pie Bars, Vegan Gluten-Free Pumpkin Pie, Pumpkin Pie Green Smoothie, and Pumpkin Cinnamon Rolls! 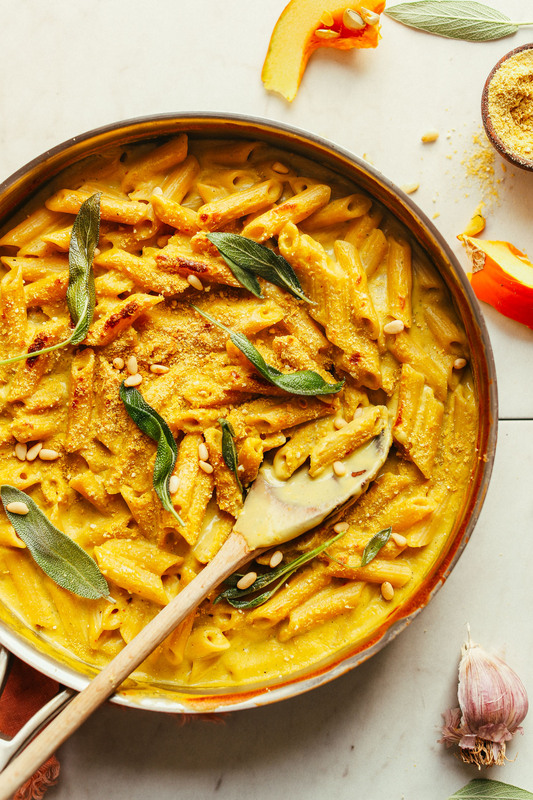 Amazing, creamy, flavorful pumpkin mac 'n' cheese made with 10 simple ingredients! The perfect dairy- and gluten-free entrée for fall and the holiday season! 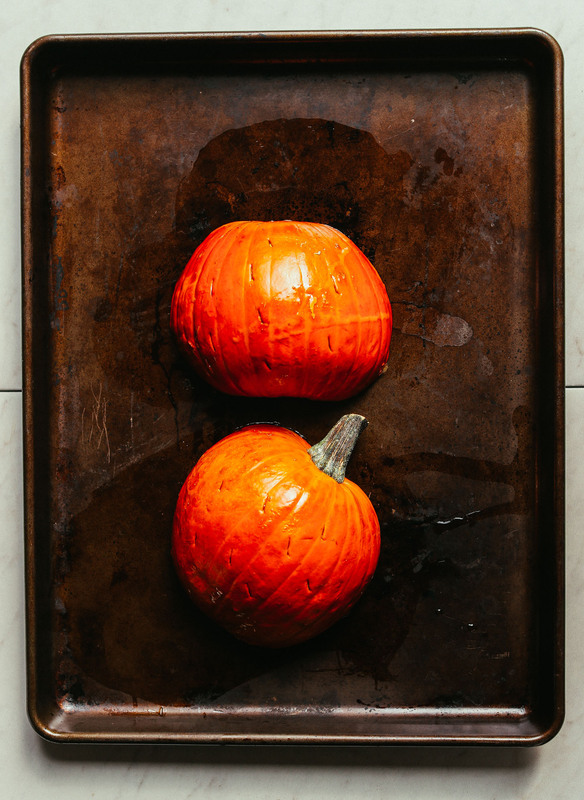 If baking your pumpkin, preheat oven to 350 degrees F (176 C) and line a baking sheet with parchment paper. Otherwise, if using canned pumpkin puree, skip to step 4. Optional: Brush the flesh with a neutral, high heat oil, such as avocado. And place flesh down on the baking sheet. Bake for 45-50 minutes or until a fork easily pierces the skin. In the last 20 minutes of roasting, add the two cloves of garlic still in skin to the baking sheet to slightly brown and soften. Then remove pan from the oven and let the pumpkin cool. Also peel garlic cloves and set aside. If serving with pasta, start boiling water and cooking pasta at this time. Once pasta is cooked, drain and set aside. Optional: I like to drizzle mine with a little olive or avocado oil and a sprinkle of sea salt and vegan parmesan cheese for extra flavor. To make the sauce, add 2 cups (as recipe is written // adjust if altering batch size) baked pumpkin (or pumpkin puree) to a high-speed blender along with peeled roasted garlic, arrowroot starch, dairy-free milk (starting with amount at lower end of range), sea salt, sage or thyme (I used both), nutritional yeast, vegan parmesan cheese, pumpkin pie spice, and red pepper flake (optional). Blend on high until creamy and smooth. Then taste and adjust flavor as needed. Add more salt for saltiness, nutritional yeast for cheesiness, sage or thyme for herbiness, vegan parmesan cheese for depth of flavor, pumpkin pie spice for pumpkin flavor and warmth, or red pepper flake for spice (optional). To heat/thicken the sauce, pour into a rimmed skillet and heat over medium-low heat, whisking frequently until sauce is hot and slightly thickened - 3-5 minutes. If it gets too thick, thin with a bit more dairy-free milk. To serve, add cooked pasta to the sauce and toss to combine. Serve as is or (optional) sprinkle with 2 Tbsp (10 g // as recipe is written // adjust if altering batch size) vegan parmesan cheese and broil on medium for 1-3 minutes, watching very carefully until barely browned. Enjoy hot and garnish with pine nuts or sautéed sage if desired. Cool leftovers and store in the refrigerator up to 3-4 days. *2 cloves garlic is equal to ~1 Tbsp minced. *If using canned pumpkin puree, add the garlic raw to the blender or sauté in 1 Tbsp oil for 1-2 minutes over medium-low heat before blending. I used canned pumpkin and it worked just fine! My mom gave me 4 cups of left over frozen pumpkin, so I had to give this recipe a try. I used cornstarch instead of arrowroot and used coconut milk for the plant milk. It was absolutely delicious. I will definitely be making again. I wasn’t sure how I was going to like the flavor combination but I actually really liked how everything came together. My only suggested change would be using less arrowroot (1 tablespoon max) as this did taste a bit starchy. I added a lot of crushed red pepper and sauteed mushrooms to mine, then broiled for 3 minutes with additional vegan parmesan cheese and panko to top everything off. So delicious !! This confort food is perfect for automn. Made this as a dish for thanksgiving and it was so yummy! I used corn starch instead of arrowroot (cuz I couldn’t find any) added cinnamon and extra pumpkin pie spice, also lots of the vegan parm cheese which was delicious, and baked it for 15 min after. Would definitely make this again. Lovely! Thanks for sharing, Taylor! Next time would you mind leaving a rating with your review? It’s super helpful for us and other readers. xo! This was my first time using fresh sage. Google it. It’s extremely bitter and do not use too much! It ruined the whole recipe. Next time I would just stick with the dried thyme I have in my cabinet. Dana, I feel like it would be helpful to note *dried* in the ingredients list or mention a warning in the post. I saved time by cooking the whole pumpkin in the instant pot. I love this recipe! I’ve made it several times and tweaked it a bit each time. Since I usually serve it as an entree, I like to bulk it up and add more protein. So, I added 1 can of white beans to the blender with everything else and then adjusted the seasonings. Sometimes, I add roasted kale (tossed with a little oil, salt, and pepper) on top too. Hello! I made this recipe yesterday for dinner but apparently I made too much pumpkin purée! I have a lot of leftover. Any idea what I can do with the rest of a pumpkin purée? The sauce was delicious, thank you for this recipe! Hi Klara! You may be interested in our pumpkin recipe roundup :D Check it out here! This was absolutely amazing and so easy to make. I ended up adding more fresh herbs and more red pepper flakes for spiciness. I did add some black pepper st the end too. I would like to know if you think this would be worth baking? I am going to make it for thanksgiving and will be using smaller noodles. My thought is to put in a casserole dish, and top it with bread crumbs and bake for maybe 15 @ 350? I want it to stay creamy and not sure if it will. Main go-to for recipes. My omnivorous husband loves you! Hi Lindsay! We haven’t tried baking this dish and can’t say for sure, but if you experiment with it, report back! Good luck! Hi Dana! I have a friend I’m making this with that’s intolerant to garlic. I love garlic, and would love to include it, but I clearly can’t. Do you think the recipe will be okay without it or do you have any mods (extra spices, etc) that may be a good substitute? Hi Sarah! I would just leave it out in that case! Does this mac ‘n cheese freeze well? If not, do you have another recipe that does? This recipe does not freeze well and our other ones don’t either, but you can keep leftovers and store in the refrigerator up to 3-4 days. Hope this helps! This is my FAVORITE go-to recipe! So cheap, simple, easy, AND delicious! I don’t have a high-capacity or high-powered blender… So I sautee the sage, garlic, and pumpkin pie spice in the oil before adding in the pumpkin. Absolutely no need to blend – it’s delicious as-is! 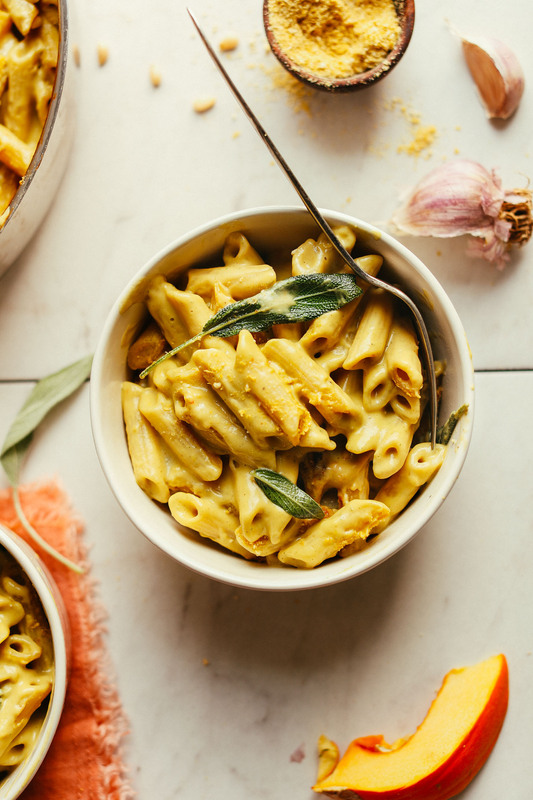 For a bit of added protein, I swap in red lentil pasta… Soooo dreamy and filling! Every time I warm it up at work, I get loads of compliments on the smell. I mostly loved this! It was creamy, warm, and satisfying. However, I’m not big on sweetness, so the pumpkin pie spice gave it too much of a dessert vibe for me. I tried balancing it out with extra nutritional yeast and cayenne pepper, which helped. I want to try this with canned butternut squash to see what that does to the flavor! I LOVE this recipe – I’ve made it a couple of times and tonight I really wanted some comfort food – also had fresh peas. It was wonderful- thank you !! We’d love to see what you cooked up, Linda! To share a photo, upload it to Instagram and use the hashtag #MinimalistBaker so we can check it out! Love lots of your other recipes and keen to give this one a try. Would it be possible to substitute sweet potatoes instead of the pumpkin?? Or would that not work? This was AMAZING! 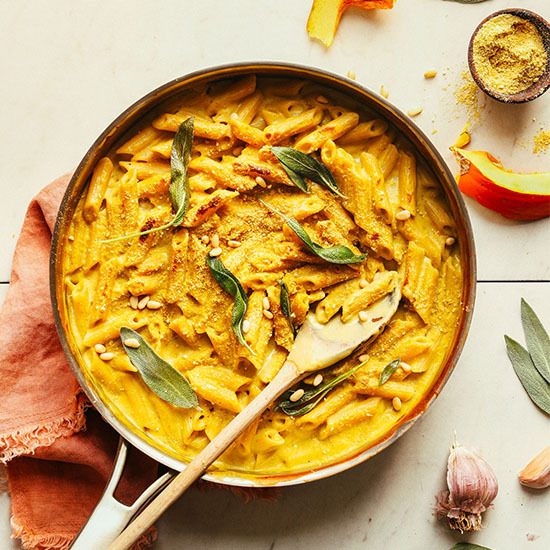 Used canned pumpkin, and instead of blending I sauteed the garlic, sage, and spices in a pot, added the pumpkin and milk, and then slowly incorporated (TONS) of nutritional yeast until it hit desired flavor and texture! So easy and SO delicious! Yay! We are so glad you enjoyed the recipe, Sophie! I added a rinsed tin of white beans, whizzed up in my nutribullet to up the protein content. Tasted delicious! I made this on a cold Spring night. Amazing texture and flavor! I did not have sage or thyme handy but added 1 tbsp Herbes de Provence, dijon mustard and omitted the arrowroot starch. I placed the pumpkin ‘cheese’ sauce with the gluten free pasta into a casserole, topped it with Daiya cheddar cheese, popped it in the oven for 15 mins for an extra crispy topping. I garnished the dish with fried capers. Really an inspirational recipe, thank you, Dana! This is amazing!!!!!! Instead of using pasta i used brown rice it was great! I’ve made this twice and I only used Canned pumpkin. I added garlic infused oil to the pumpkin as instructed in the notes and it really helped! I added steamed broccoli, vegan cheese, basil and sriracha to it and this is definitely a keeper! Made this for dinner tonight, using canned pumpkin. Was pretty good, but agree that fresh pumpkin would have been better. For me, this dish needs something to make it interesting. It was bland. I used the fresh pumpkin, and I like pumpkin, but the sauce tasted starchy and flat dispite the seasonings. I love this recipe! Today was my second time making it and I didn’t have a dairy free milk this time! So I subbed it with Trader Joe’s Veggie Stock and it was just as delicious! Noms, noms, noms in my belly it went! I just made this for dinner tonight and it was delicious! It satisfied my craving for something warm and creamy on a rainy day. I could eat this sauce with a spoon! That being said, I actually served it with some gluten free gnocchi and threw in some pan seared tempeh for extra protien. I found that adding the red pepper flakes and a little extra salt really made a difference in the taste. I made this last night, and I loved it. I was looking for an alternative to tomato sauce and this recipe was a welcomed change. I used canned pumpkin and found my sauce to be a little off (too bitter maybe?) so I added some unsweetened applesauce to take the edge off and that worked out great. I wonder if baking the fresh pumpkin makes the sauce naturally sweeter. I’m too tired when I come home from work to do that extra step. I also liked the consistency of the sauce, very comforting on a winter night. Thanks again for sharing your amazing ideas with us!! Yes, that was likely the case with the pumpkin, Chrissy! Glad you enjoyed the recipe! I made this last week (with canned pumpkin) and it was better than I was anticipating. 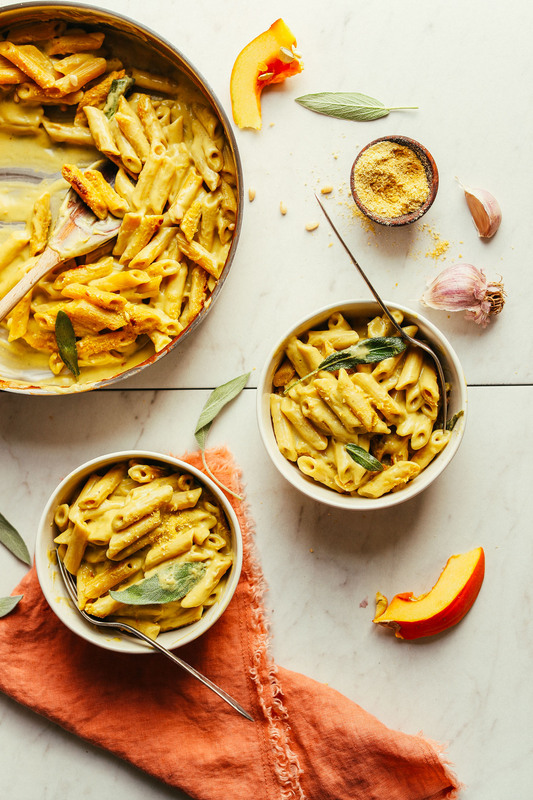 I’ve never had pumpkin pasta before, so I wasn’t really sure what to think before cooking, but this turned out well! Even my boyfriend said that he was surprised at how good it was! The leftovers weren’t my favorite – I find that cashew cream sauces thicken up so much that it makes the leftovers a bit less appealing to me, but I would definitely make this again. I made this last night for my husband and I. He usually dislikes cheese and never grew up liking mac and cheese, and he loved it! The sauce was perfect and I used red lentil pasta to hopefully up the protein. We made it with salad and roasted veggies as well! Thanks for the recipe!! I made this tonight. Dear sweet Baby Jesus: the BEST vegan mac and cheese I have ever had. Hands down. We grew “tan cheese” pumpkins in our garden this Autumn which are wonderfully flavorful. I roasted one of those. I subbed cashew milk for almond (I try to minimize almond use due to the water issues in CA). I didn’t have pumpkin pie mix and used cinnamon instead. Added the optional red pepper flakes. Definitely used your vegan parm (love it!). I had fresh sage from my sister-in-law, so I added half fresh sage and half dried thyme. FANTASTIC! 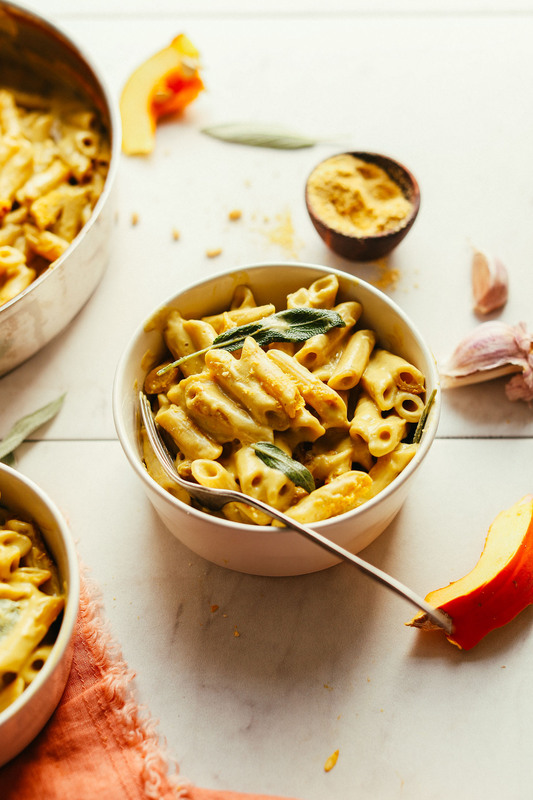 My new go-to vegan mac and cheese. Cheesy, creamy, flavorful, comfort food. Thank you! Tasted before adding spices, was a little too sweet. Swapped pumpkin pie spice with cumin and chili p and tofurkey sausage and it came out nice and smokey. Cayenne is definitely a must on the list of optional items. This one was wonderful, never would’ve thought of using pumpkin as base for mac n cheese. I made this yesterday, roasted my own pumpkin and added broccoli. I totally recommend this recipe, it was amazing! I was sooo excited to make this and it did not disappoint! I did half sage, half thyme. I used cornstarch because I did not have arrowroot starch – no issues there. I also used canned pumpkin and still tasty. Maybe someday I’ll roast a pumpkin, but for now, I’m about that #cannedlife. Looking forward to making a bigger batch next time! This looks like the perfect fall meal. I recently made something similar but totally forgot the sage! Saving this recipe!! I made this for dinner last night and it was wonderful! I subbed dry sage and thyme for fresh and also added chopped mushrooms and spinach which worked well. I did everything else the same as written above and it turned out great. My toddler loved this too, so I will definitely be making this again. Lovely – thanks for sharing, Elizabeth! Is there an alternative to arrowroot starch? Maddie – I have always used cornstarch as an alternative. Dana, is there any reason that wouldn’t work in this particular recipe? You can just leave it out. It helps to thicken the sauce but it’s not necessary. I didn’t have any arrowroot or cornstarch, so I used coconut flour & baked it for 20 mins rather than cooking it on the stove. Worked really well! That’s great – thanks Taylor! Cornstarch and arrowroot can usually be used interchangeably. Judy, sorry you didn’t enjoy this! Did you have the chance to use fresh pumpkin? It yields the best flavor in my opinion. I JUST made this and it’s glorious. It’s so rich even without any added fats (I didn’t use the olive oil). I used canned pumpkin and red lentil penne so I had it on the table in like 20 minutes. I subbed the fresh sage for 1 tbsp dried and the vegan Parmesan for more nutritional yeast (and a little more salt too) because I was lazy and didn’t want to make vegan parm. You could definitely stretch the sauce further and make another serving or two of pasta – but I like it saucy so this was perfect. Gonna bring it to school and reheat it tomorrow for lunch. Yum! Oh – I also used raw garlic instead of roasted and I didn’t find it overpowering at all. Sorry for all the subs, but I was in a hurry to get this in my belly and boy was it good!!! Whoop! thanks for sharing, Sarah! Do you think this would freeze well? Thinking ahead to Christmas dinner! You could probably freeze the sauce, but not the pasta. Lindsey, yes you can freeze the sauce! For up to 1 month. Just keep it separate from the pasta. This looks delicious! Thank you for sharing – I will be making this with my extra fresh pumpkin puree from Thanksgiving desserts. This looks great! I live in the uk and don’t think we have ready-made pumpkin pie spice mix here… is there a spice blend I can make myself? Hi Beth, I’m a Brit transplant. Try mixed spice that you would use for fruit cake. Beth, you can sub a mixture of cinnamon, ginger, nutmeg, clove, and allspice! I was JUST talking with my mom about making vegan mac & cheese with pumpkin! Definitely using this recipe this week. I definitely want to make this for Thanksgiving! For the sake of saving time, I like the idea of using pumpkin puree. Does this sacrifice any flavor or anything? I made this dish this evening with store bought puree and I didn’t think it was that flavorful. I am going to buy a pumpkin to bake tomorrow for our Thanksgiving dish. I think fresh pumpkin would be amazing but when I made it I used purées pumpkin and it was still incredible. It had a slight sweetness but can only imagine what a fresh, roasted pumpkin would do!